In the example siggy we used ~♥~ instead of the extra break, but use what ever you want. [fontc=#FFFFFE]STUFF HERE[/font] will give you the invisible font you want. You can also use codes like [fontc=snow] and any other light shade of white. Feel free to edit it. PLEASE don't use it as your default neoHTML code!! it's very frustrating, only use it for things like "invisible siggy pets" or the popular "highlight here" gags. This is a very very simple example. Put it in your neoHTML space. Go nuts, but remember to keep the fake siggy *very* short since you're limited on room. 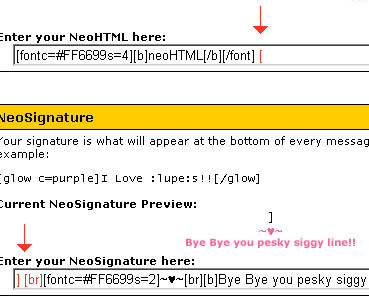 Also - unless you know what you're doing, it's best not to have anything in your neoSignature spot. As you may have noticed, posting a link on the NeoBoards causes your font to mess up big time. So each time you're trying to be helpful by posting a link to the Snowager or Turmaculus your font gets killed. What to do? The answer is simple! After you paste the link into reply box, place some more text, then post your reply. This way your font will look just as you want it to look. If you are very attached to having just one avatar and don't want your active neopet to show on the Neoboards, you can visit our Hiding your pet on Neoboards tutorial.